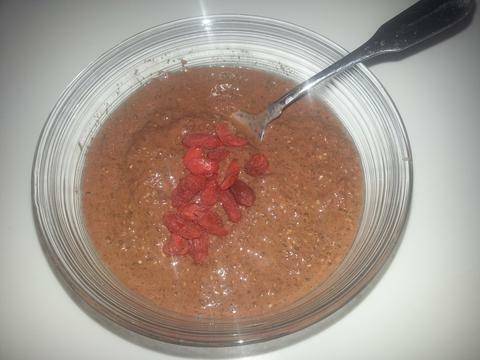 What's in this chocolate chia pudding - raw cacao, almond milk, chia seeds, maple syrup, vanilla extract. That's it. Now let's talk about why this combination is such a powerhouse of nutrition and you can eat it for breakfast or a nutritious snack. It's that good and nutritious. Raw chocolate straight from the cacao bean - a superfood known by the Aztecs as "Food of the Gods". It packs up to 10x more antioxidants than blueberries, green tea or red wine. Cacao has been said to help lower cardiovascular disease and lower stress. Chocolate in commercial foods is mixed with sugar, milk and lots of additives. Some wonder if there is really any true cacao in them. Think of all that Halloween candy, is it healthy like raw cacao, NOT. Antioxidants increase neurotransmitters in the brain that promote rejuvenation, elevate our moods and give us a positive outlook. Due to this, eendorphins may be released that can help reduce depression, increase mental clarity and make you feel terrific. Isn't it fabulous that raw cacao is packed full of these antioxidants in a delicious treat. Raw cacao is packed full of magnesium ( and we wonder why pre-menstrual women and women during their monthly cycle crave chocolate?) Magnesium helps balance our brains chemistry, stop spasms, balance our hormones and create strong bones. When raw cacao stays raw it has increased levels of anti-oxidants. When it is cooked into a dark chocolate bar it still has antioxidants but not any where near the quanitity in the raw product. Why not get these benefits in a tasty food. Chia seeds are rich in omega 3 fatty acids, fiber and protein. This tiny seed packs amazing nutrition. It has virtually no taste and blends well with many fluids. Recently in the news you may have seen a young man that ate chia seeds without soaking them first and they became jammed in his esophagus. 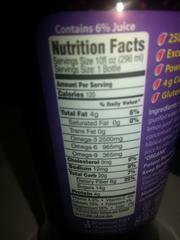 What chia seeds do is they expand to 10 times their size when put in fluid. I believe that when this young man ate the seeds they expanded using his own body fluids. Therefore, I so recommend that you soak them first and then you’ll have no problem. 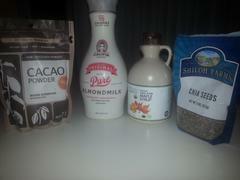 Chia is very rich in antioxidants and unlike flax they do not need to be ground to make their nutrients available. They are packed with fiber, calcium, phosphorus, magnesium and other minerals that enrich our bodies. You may see chia seeds in power drinks in your health food store, I took some images of them, they are basically filled with sugar juices. You can easily make your own chia drinks. I find that just adding a tablespoon to my water is an easy way to get the chia in my body. In Mexico they make a drink called chia fresca. They take water, chia seeds, lemon juice and some sweetner. Mix it all together, either in a covered jar that you shake very vigorously or I prefer to use a magic bullet or vitamix. Put in the refrigerator for a few hours and then enjoy. I make mine in the evening and had it for breakfast. It was absolutely divine. Try it, leave a comment below letting me know how you like it.